A Extreme Sailing tagged image from photographer – imo.un as published on Flickr. Accepting the IMO medal and certificate on behalf of his crew, Captain Kristensen said the award should also be shared with the passengers, the Norwegian soldiers who assisted the crew during the fire-fighting, and the Norwegian rescue teams and fire-fighters who supported them. “As Captain, I watched the fire from the bridge, while the crew were fighting it on the open deck in high seas, facing an intense situation with extreme heat. Or striving in the engine room to avoid a blackout which could have had fatal consequences for the ship, the persons onboard and the environment. Personally, I am very proud to be Captain of this crew which managed so well under those extreme circumstances,” Captain Kristensen said. Captain Kristensen and his crew were nominated by Denmark for their courage and determination in fighting blasts and fire on board the vessel, at great risk and danger to themselves. The sounding of the fire alarm aboard the Danish-flagged vessel Britannia Seaways, shortly after 7 p.m. on 16 November 2013, interrupted a routine voyage through heavy seas from Sørreisa to Bergen (Norway). Twenty crew and 12 passengers were on board the vessel, while the cargo included around 70 tonnes of diesel, aviation fuel and gasoline in jerrrycans and tank containers. The fire broke out on the open deck due to shifting of cargo and evolved aggressively with explosive eruptions, with flames leaping 30 metres high. Captain Kristensen and his crew fought the fire for hours, battling extreme heat on a rolling ship, 70 nautical miles from shore, as fresh gales fanned the flames. Captain Kristensen took the decision not to evacuate all non-essential personnel by helicopter, as this would have exposed the fire-fighting crew and ship to more danger, since facilitating the evacuation (slow speed, turning the ship windward) would have exacerbated the fire and risked further damage and possible pollution. Had the fire not been contained, there was a huge risk it would have spread to the maindeck below and raged out of control. An explosion below deck caused the engine control system to break down but the crew succeeded in transferring operations to manual mode and kept the engines, auxiliary engines and fire pumps running, while controlling the huge amounts of water coming into the cargo holds from the firefighting. Thanks to heroic team work, risking their own lives in intense heat to avoid a more disastrous outcome, Captain Andreas Kristensen and his crew managed to manoeuvre the burning ship and head towards the Norwegian coast, taking shelter behind some coastal islands. A firefighting vessel attended the ship from 1.30 a.m. and a firefighter team assisted from 4.30 a.m. with the fire finally extinguished shortly before 8 a.m., on 18 November 2013, some 13 hours after it broke out. Five professional rescue workers from Argentina and two from the Republic of Korea also received certificates of commendation during the ceremony. •Prefect Julio Alejandro Weimann, Principal Officer Jorge Luis De Zan, First Adjutant Silvio Ledesma, crew of the PA43 rescue helicopter (Dauphin AS 365N2) of the Comodoro Rivadavia Air Station, and Principal Officer Juan Burgoa and Second Adjutant Francisco Morales, rescue swimmers of the Comodoro Rivadavia Rescue Station, Argentine Coastguard, were nominated by Argentina, for rescuing, in strong winds, rough seas and darkness and at high risk to their own lives, two sailors off the capsized sailing vessel The Wild Rose. First Adjutant Silvio Ledesma was at the ceremony in person to receive his certificate, while the others were received on their behalf by Her Excellency Ms. Alicia Castro, Ambassador of Argentina to the United Kingdom and Permanent Representative of Argentina to IMO, and Prefect- Major Mario Farinón, Technical Adviser from the Argentine Coastguard at the Embassy of Argentina in London Inspector Lee Sung-Hee, Chief, and members of the 122 Rescue Team, Pohang Coast Guard Station, Korea Coast Guard, who were nominated by the Republic of Korea, for rescuing, in heavy rain, gale-force winds and high swells, eight crew members of the cargo ship M/V Chenglu 15, which was sinking after hitting a sea wall, and for recovering the bodies of six other crew members who, unfortunately, did not survive the ordeal. Inspector Lee Sung-Hee, Chief of the 122 Rescue Team was at the ceremony in person to receive the certificate. •Inspector Sueng-Young Shin and Inspector Soon-Hyung Lee, Special Rescue Unit of South Regional Headquarters, Korea Coast Guard, who were nominated by the Republic of Korea, for saving the bulk carrier M/V Captain Vangelis L, in high swells, by plugging a hole in one of its fuel tanks, caused by a collision with the M/T Green Plus, thus preventing a major pollution incident. Inspector Shin Sueng-Young and Inspector Lee Soon-Hyung attended the ceremony in person to receive their certificates. In addition, letters of commendation were sent to nine recipients. Details are available on the IMO website. Congratulating all the recipients, IMO Secretary-General Koji Sekimizu said they had put their own lives on the line in some of the most dangerous situations that could be encountered at sea, in order to save others and prevent environmental catastrophe. 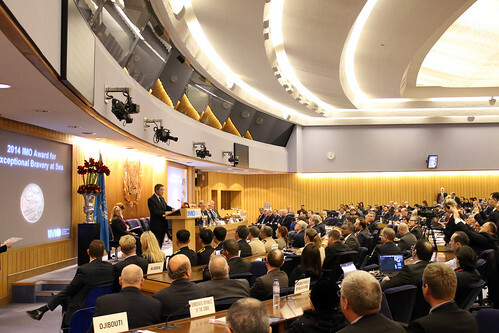 Captain Kristensen also addressed the Maritime Safety Committee delegates, who were attending the ceremony, at the end of the first day of the Committee’s 94th session. “You who are here today should feel included in the honour. Much improvement is due to the focus and attention on safety at the highest level. You set the framework that keeps driving safety improvements for the operations of ships throughout the globe. Standards that prevent fire or other accidents are just as important as the routines, training and equipment that shall enable us to handle the incident, once it occurs. We are all in this together,” Captain Kristensen said. This annual award was established by IMO to provide international recognition for those who, at the risk of losing their own life, perform acts of exceptional bravery, displaying outstanding courage in attempting to save life at sea or in attempting to prevent or mitigate damage to the marine environment. For the 2014 award, 35 nominations for the bravery award were received, from 12 IMO Member States and one non-governmental organization in consultative status. What to Wear Before Sailing?